GamesandLearning.org has published a survey of American teachers looking at their use of games in the classroom. My sense is that there’s likely to be a fair degree of correlation with the Australian experience and there are a couple of interesting findings. Fifty-five percent of students play games at least weekly. That would certainly sit solidly with my own kids’ experiences in primary school. That relatively high number becomes more readily comprehensible when you learn that far the greatest benefit in using games lies in motivating low performing students. 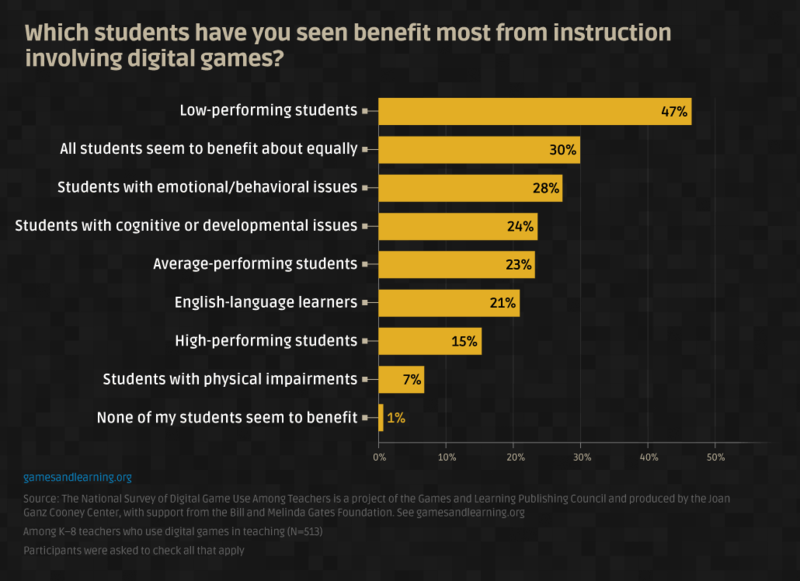 Unfortunately, while teachers said the “use of games can have a huge benefit for those students who have struggled in regular school situations and tests” the survey doesn’t dig into exactly why this is so. The major limitation in using games was finding games that align to the curriculum. While it’s clearly possible to take almost any game and find a means of aligning it with the teaching outcomes expected that takes time and effort. If you take Minecraft as an example there are endless way it could be used, but they don’t come ready-made out of a box. It makes sense in that context that the primary way teachers cited that they found games was through recommendations from other teachers. It would be nice to see some follow-up on the idea that the use of games makes a real difference with under-performing students. It would also be nice to see more clarity in exactly what that means given that findings’ potential juxtaposition with the idea that it’s hard to match games with curriculum outcomes. Does it just mean that under-performing students are excited to be playing the games and become more engaged in the class? Or does it mean that their results improve after playing games? Or does general engagement lead to better results anyway? The use of games in the classroom is rich with possibilities; but, as with all things educational, it relies on engaged and motivated teachers to put in the effort to fulfill the potential. For the full survey see here.